StencilGirl Talk: Fancy Houses Stencils are here for StencilClub members in December! Fancy Houses Stencils are here for StencilClub members in December! Oh, the windows you'll paint and the artistic doorways you'll open with this StencilClub set by Valerie Sjodin. Houses in Amsterdam, the Rice Museum, and playing trains with her grandson inspired her to design Fancy Houses! Valerie will show members how to make a town full of fancy houses as a standing accordion journal. There are so many ways to interchange the levels and rooftops of these buildings, you are sure to combine them for a dream home or town in your artworks, but the only way you can build them is to be a part of StencilGirl's Stencil Club by December 15th, 2018. Find out more/join now, RIGHT HERE. 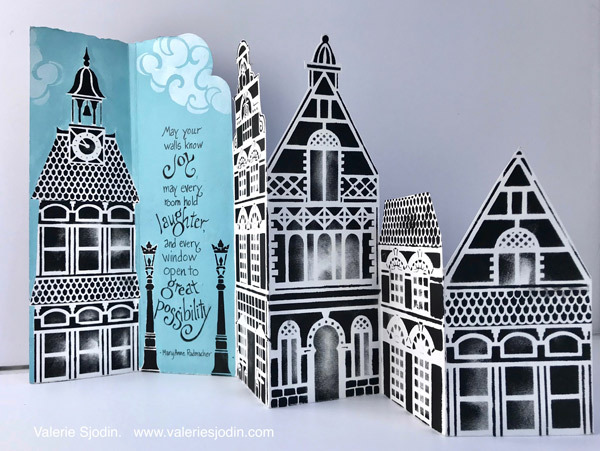 These are fantastic Valerie, they look exactly like the houses in my hometown :) And I love that you also made the bell tower from the Rijksmuseum! Amazing!